Measuring your team’s hourly data to determine who is a full-time employee and must be offered affordable health coverage. Keeping track of all the months where health coverage is required, and showing you months where health coverage was and was not offered. Giving you an easy way to offer health coverage to your full-time employee when it’s required. After you’ve setup ACA compliance on GoCo, you’ll land on the Compliance Status page. On this page, you’ll be able to quickly see if your company is meeting the ACA compliance requirements for your team for the current calendar year. Quickly view all of the areas where your company is not being ACA compliant. GoCo will give you the reason behind each compliance status and provides an easy way to fix potential compliance errors moving forward. On the Future Coverage page, you will see a list of your team’s active measurement periods. These measurement periods will determine if the employee is full-time (working over 130 hours per month). All full-time employees will need to be offered health coverage. This page is a great way to see who will be Gaining Coverage, or potentially Losing Coverage in the future. Knowing this information makes it easier to understand how the ACA will be impacting your company’s health coverage renewal in the future! On the coverage changes page, you’ll be asked to review and apply the necessary coverage changes required to remain ACA compliance during the active admin periods defined by the IRS. For example, if an hourly worker has worked over (or close to) 130+ hours per month during their measurement period, they are considered to be full-time and you’ll be asked to offer coverage. Alternatively, if an hourly worker currently enrolled in benefits has worked less than 130 hours per month during their measurement period, you are allowed to remove coverage and remain ACA compliant by doing so. GoCo will ask you to upload the hours worked for your hourly employees. This is used to determine the full-time status of your hourly workers. Any employee who has worked over 130+ hours per month for a 12-month measurement period is considered a full-time employee by the IRS, and must be offered affordable health coverage! 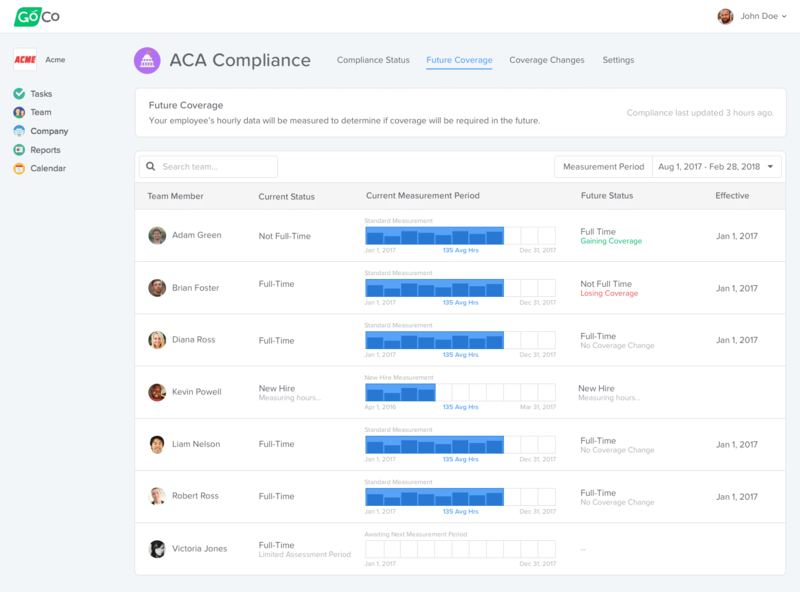 Once the hours are uploaded, GoCo will automatically assess the total hours worked and determine if each employee is considered Full-Time under the ACA regulations. You’ll be able to easily see how your team’s hours are being measured on the Future Coverage page! Near the end of the filing year, GoCo will work with your company directly to send the 1095-C and 1094C forms to the IRS, and your employees. These forms are used by the IRS to determine if your company has offered affordable health coverage to all eligible full-time employees. 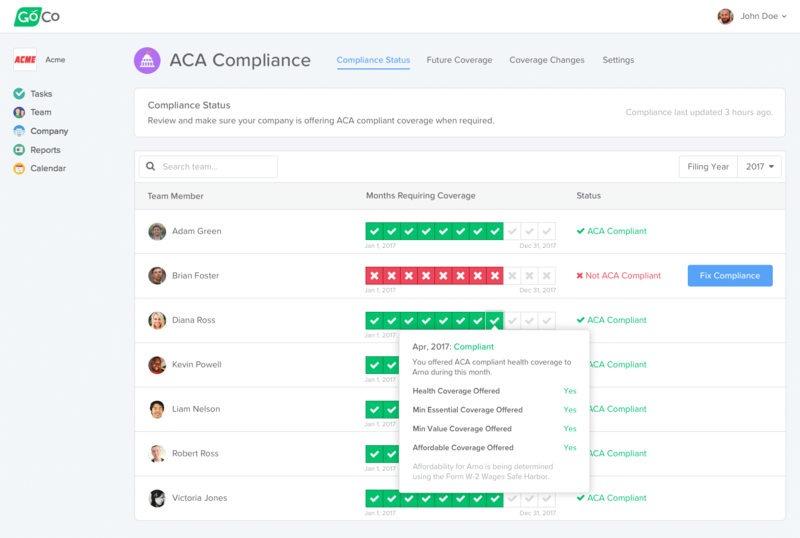 Get Started Using ACA Compliance on GoCo! ACA Compliance is now available to all GoCo customers who have their benefits setup on GoCo. As a company admin, simply go to your Company profile page and click Setup on the ACA Compliance card to get started! We’re excited to hear your feedback for ACA Compliance! If you have any feedback, questions or concerns please feel free to contact us at hello@goco.io. Want to learn more about how ACA Compliance works on GoCo? You can check out our Help Center documentation that goes into more details! Next Post →Is your offer letter helping or hurting you?